One thing that Julia Child and I have in common is that we both dealt with culinary figures of authority who didn’t believe in us. Child’s was Madame Brassart, owner of Le Cordon Bleu in Paris. Mine was Miriam, my baking teacher at Dan Gourmet in Haifa in 2010, where I studied intensive baking. I followed Miriam’s every movement, learning from her a solid knowledge of baking—especially bread baking—that I call upon every day of my life. But when it came down to it, she just didn’t think I had it. When she gave me a mark of 70 for my classroom studies, I was floored—gutted you could even say. I went to her office to contest the grade to no avail. If I was certain of anything in the world, it was that I could bake. I knew the techniques and executed them well, but sometimes it’s not just about ability. I was the quiet, studious American in a classroom filled with raucous and warmly charming Israelis, and my shell of formality irked her. Despite the setback, thumbing through my old Hebrew recipes from Miriam’s class, I still experience waves of nostalgia. 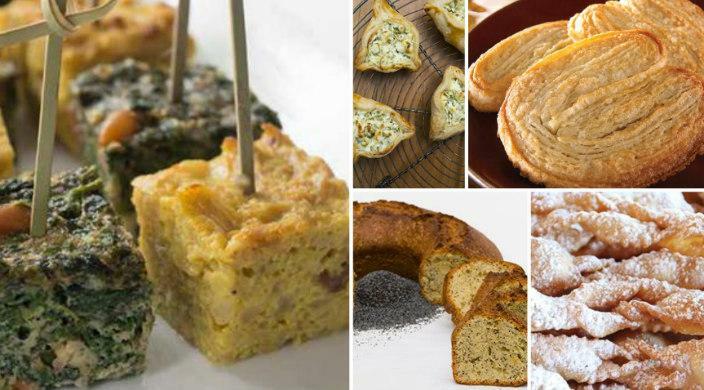 And though I have expanded my knowledge over the years in a never-ending quest of self-improvement, I still refer to my former instructor’s recipes when I’m looking for Israeli inspiration with a twist. 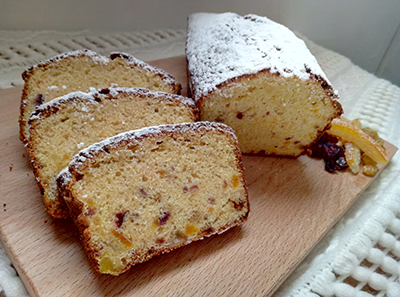 The cake, which also contains pieces of finely chopped yellow raisins, dried cranberries and dried apricot, makes a pleasant snacking cake that will perk up any afternoon tea or coffee break during the dark winter months. Chag sameach! 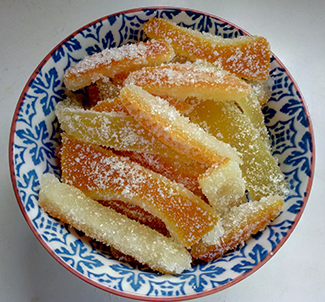 This recipe makes more candied peels than you will need for the cake. Store the remainder in an airtight container once fully dry, or dip the ends in melted chocolate to create classic orangettes. Bring a large pot of water to boil, add orange peels and simmer for 15 minutes. Strain and set aside. Bring 3 cups sugar and water to a boil, then reduce to a simmer and cook the sugar has just dissolved. Add the orange peels let cook for 40-45 minutes, or until tender. Place peels in a strainer and rinse off, draining the excess syrup and then cool by washing with cold water. Dry peels completely, then roll in the remaining 1 cup sugar to coat. Lay candied peels flat on a cooling rack placed over a parchment paper-covered tray and let air dry until set (a few hours to overnight). The method in which this cake is formed is very important to a successful outcome. That is because most of the leavening work is done by whipping air into the butter-and-sugar mixture, which is then supported by the slow emulsification of the eggs entering the batter one by one. That said, this sacred process only requires you to have a bit of patience—not a special baking skill. The cakes themselves are very rich, and taste even better when aged for a few days. They slice and freeze well and hold up wonderfully in transport. A nod to the good old days—when the only thing considered healthy was a good appetite! Preheat oven to 350 degrees. In a medium bowl, sift together flour, baking powder and salt. Set aside. In a stand mixer, beat sugar, butter, lemon and orange zest together for 10 minutes, until pale in color and fluffy. On medium low speed, add eggs one at a time, incorporating each egg completely before adding the next. When all the eggs have been incorporated, add the extracts and beat to mix. Add 1/3 of the flour mixture, and beat until just combined. Add 1/3 of the sour cream, and beat until just combined. Continue in this pattern ending with the last of the flour mixture. 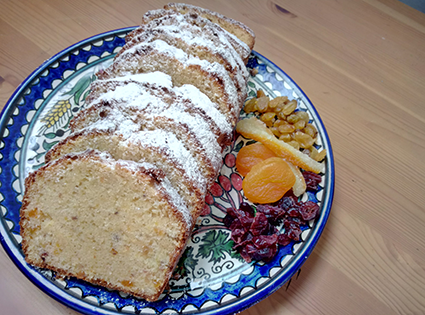 Fold the dried fruit and orange juice mixture and chopped candied orange peel into the batter. Split the batter between two large loaf pans, and bake for 55-60 minutes, until a toothpick comes out with a few dry crumbs attached. Let cakes cool on a wire rack for 10 minutes, then gently dump out of the loaf pans, to continue cooling. Sprinkle with confectioners’ sugar using a small sieve to decorate just before serving. 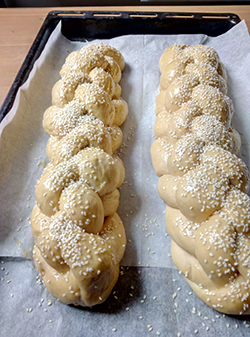 Want to make beautiful braided Challah? Click Here!